Peppe Gonzales has always been the perfect cabin steward but this cruise is different. 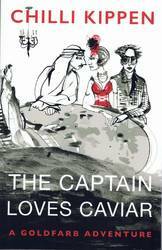 When last on shore leave Peppe met the man he believes to be his life partner and he is desperate to get back to him. As Peppe schemes with his lover for ways to jump ship Peppe's cabin passengers, a Saudie Sheikh and his entourage, a wealthy Argentinean couple, Goldfarb an eccentric Jewish gambler from New York, a Native American Southern Belle with attitude and the ship's sophisticated and eloquent lecturer concentrate on their own agendas. While romance blossoms between Goldfarb and a mystery woman he met in the casino and the Sheikh's wives are out to play, the remaining passengers enjoy the advantages of 5 star cruising unaware that plots are afoot to rob them of their jewels and maybe their freedom. The froth of champagne bubbles and Haute Cuisine on board the cruise ship sets the scene for comic Machiavellian antics as the journey heads toward an astonishing and unpredicatble ending.